The other day I went in for my very first root canal. Because of a hiccup in the insurance I couldn’t get my face drilled that day and had to reschedule. I’ve only had one cavity in my life and it came right at the end of my marriage, so I put off taking care of it…for two years. Obviously, cavities left alone become bigger problems, but it didn’t hurt so I could ignore it and simply chew on the other side. Until my tooth was chipped last month (while eating a hard candy…sheered a corner right off! ), I had never had any dental work done on my teeth. I knew nothing of needles and drills. When I related this to the friendly root canal receptionist with the voice like a young Kathleen Turner, she was flabbergasted that I had put off root canal treatment for so many years. “Haven’t you experienced any pain?” she asked. “Not very much,” I replied, and added a shrug for good measure. She told me that I was one of the lucky few. I don’t often think of myself as a lucky person. Odd things happen to me—strange and inexplicable. I often tweet about them for laughs, but good luck does happen to me as well. For example, over Christmas my friends surprised me with a brand new iPad Air. Last Spring when I was destitute & damaged after my car accident, $500 dollars anonymously arrived in the mail. I focus on the bad luck because it is usually wacky and more entertaining to talk about, but in actuality I am more blessed with good luck. I win random contests all the time. I bump into celebrities. I accidentally discover new TV shows/music/artists that I didn't know I loved. My life is a fortune cookie filled with surprises. I'll focus on a few topics of interest and how they affect my life: Depression, ADD, Chronic Motor Tic Disorder, Insomnia, Sleep Apnea, and for fun Good Luck and Bad Luck. Maybe somebody out there needs to know they are not alone when dealing with some of these issues. Maybe somebody just wants to feel better about themself by reading about the mess that is my world. Maybe they find what I have to say entertaining. I had two readers that first week: my mother and my now ex-mother-in-law. It was a humble beginning. I ended up dropping Luck from my list of topics because I couldn’t figure out at the time how to write about bad luck in a way that didn’t sound like whining. I soon developed that writing skill, but not before I had settled on ADHD & Depression as my topics of choice. Luck didn’t fit anymore. I wonder if that is still true, however. 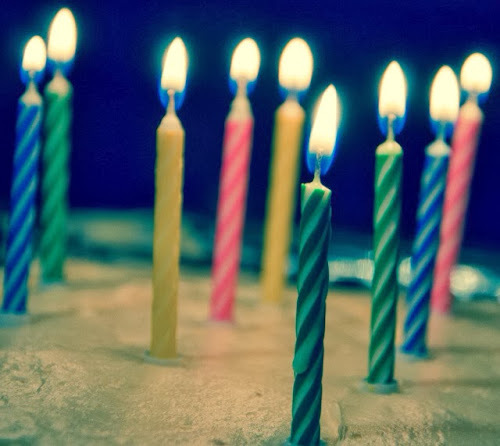 This month my blog turned nine years old. I’ve been blogging since 1995, but this blog began in 2005 and is the longest running project of my life (aside from my children). So much good has come from it. Not only because I have grown while writing nearly 800 blog entries, but also because my blog has created new opportunities and friendships. I feel so very lucky indeed. This year I will see a book published, and I am busy writing two others. I will blog on the 10th, 20th & 30th of each month as I have been doing, and I may even get out of debt. I feel more focused than I have since before the divorce. Who knows what changes await me as I blog through the year to my tenth anniversary? To blog more about the upsides of ADHD and Depression. I’ve always told my kids that character flaws are talents gone awry. I can see that with ADHD, but looking for the upside to Depression will be a challenge. It’s going to be an interesting year.